Artist Creates Drawings That Seem To Jump Out Of The Page. Simply Amazing! If you want to learn how to draw amazing 3D pieces, there's only place online where you can find the best instructions. And that is the YouTube channel VamosART. The very talented artist behind this channel regularly uploads videos that show exactly how he creates his 3D drawings. As they say, just watch and learn. The artist's name is Sandor Vamos, an artist and cartoonist from Hungary. He uses various visual tricks that make his drawings look solid. 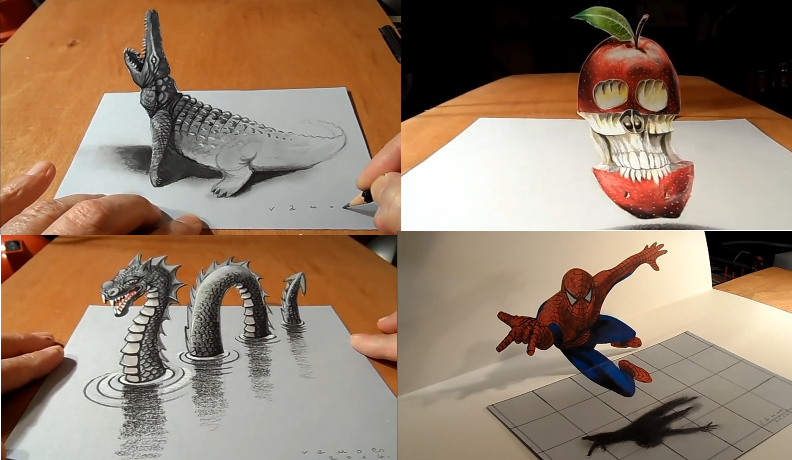 Featured below are his 3D drawings of a crocodile, an apple, and a water dragon. Really great stuff. For more of Vamos's art, just visit his YouTube channel or his DeviantArt page.